ESCI 201: Climate Change and New Zealand’s Future is a Victoria University summer course which draws on the knowledge of many of Wellington’s preeminent experts in the realm of climate change. Much like the structure of the IPCC Assessment Reports, the course begins by examining the scientific basis of climate change and then explores the implications for human societies and the various options for mitigation. Most of the guest lecturers gathered at Rutherford House on Friday for a public panel discussion that brought the three-week course to a close. The discussion began by focusing on climate change as a challenge for society. As Dr David Wratt, Chief Climate Scientist at NIWA, pointed out, climate change is an unprecedented political challenge demanding both long-term future thinking and a unified global response. Dr Adrian Macey, UNFCCC Kyoto Protocol Chair, noted that existing infrastructural inertia poses a significant barrier to change: a new coal-powered power plant, for example, would have a design life of many decades. However, Macey also suggested that the slow societal response to climate change needs to be put in perspective by considering the equal (or even greater) lack of progress on other issues, such as international disarmament. He went on to mention that climate change is, of course, only part of a larger matrix of interconnected global problems, including the often-ignored issue of population growth. So with climate change being as complex an issue as it is, combined with the deliberate and unwarranted attacks on climate change science either side of the political failure at Copenhagen, perhaps it is not surprising that so little has been achieved. 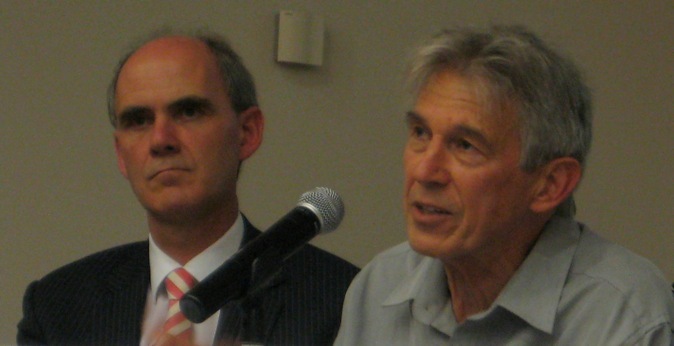 Professor Peter Barrett of the VUW Climate Change Research Institute highly recommended the 2010 book Merchants of Doubt, by Naomi Oreskes and Erik M Conway, which compares contrarianism in the climate change debate with now-discounted stances in earlier controversies like that over the adverse health effects of tobacco smoking. This led on to a suggestion from the audience that perhaps the key to unlocking the climate change dilemma lies in human psychology: a discipline conspicuously unrepresented in the panel (but one which will almost certainly be represented in future iterations of this course). New research suggests that people are more likely to lean towards climate change denial if the science is presented with a negative focus (ie emphasising the dire consequences of inaction). Could emerging insights from psychology and the social sciences lead to a significant change in climate change messaging? The effectiveness of science communication was another hot topic of discussion. Concepts integral to climate change, such as probability, uncertainty, variability and risk, make climate change fundamentally difficult to communicate to a non-scientific audience. Dacia Herbulock of the Science Media Centre raised the point that it is easy to say something spurious in the 30 second window of the news soundbite (often referring to conveniently ‘cherry picked’ studies), but to set the record straight scientifically may take 30 minutes or more: an obvious dilemma for well-informed science communication. Judy Lawrence, Senior Associate at the VUW Climate Change Research Institute, suggested that instead of trying to fashion the climate change message for distribution in mainstream media, a more effective alternative might be to target specific audiences (industry, local government etc) with tailor-made, policy-relevant messages. How, then, should scientists engage with the public? Professor Jonathan Boston, Director of the Victoria University Institute of Policy Studies, said that “we live in a context where we have to trust people to do their jobs well”. Barrett agreed that scientists should not have to justify themselves to skeptical non-scientists: we trust medical doctors to do their jobs well, why should climate scientists be treated any differently? Dr James Renwick (Principal Climate Scientist at NIWA) said that he understood why non-scientists feel that climate is something on which they can have an opinion: people KNOW the weather, it affects their everyday lives. However, this is of course the classic problem of confusing the weather with climate. Dr Lionel Carter (ARC) pointed out that since the ‘Climategate’ hacked emails saga it was understandable that scientists have become somewhat “gun shy”, suggesting that the best option was to stick to the facts and observations rather than getting involved in polarised public debates. Herbulock observed, by contrast, that “there has to be some degree of strategy” and collective thinking among climate change scientists: we need to go beyond the media and invest in educational programs, especially for young people. She also identified the important role for non-scientist communicators and responsible journalism, with Barrett pointing to the ongoing work of Gareth Renowden and Gareth Morgan. Renwick suggested that perhaps climate change science has simply not been compelling enough. Wratt followed by saying he once believed that if scientists were compelling enough the world would change, but has since realised that the issue is much more complicated than that. It seems that success on the climate change communication front will require an orchestrated effort by scientists and non-scientists alike. Questioning from the audience raised the point that in New Zealand there is currently little government-prescribed impetus for the private sector to join the climate change mitigation effort. Carter pointed out that at an international level, some leadership is actually coming from the private sector rather than governments, refering to BHP Billiton’s recent (presumably financially-driven) foray into carbon credit trading. Dr Martin Manning, Director of the Climate Change Research Institute, agreed that “the private sector is moving in and taking a strong line on climate change”, irrespective of the actions of governments, alluding to the recent actions of Deutsche Bank and the wider international reinsurance industry. Macey added that while the ideal of global ‘Green Growth‘ will not be on the horizon any time soon, significant investments in renewable energy technologies in China and Korea are setting a good example in the meantime. As Carter suggested, this will also have implications for the public perception of the climate change debate: “if industry is taking notice of this, there must be something in it”. How could governments be doing better? Macey believes there is a need for increased support for research and development and better emissions accounting systems, especially in New Zealand where agricultural methane is the primary emissions source. Dr Howard Larsen of the VUW Institute of Policy Studies clarified that atmospheric methane from New Zealand agriculture is short-lived (~one decade) and so with no growth in agriculture there is no long-lasting irreversible climate forcing, unlike with carbon dioxide emissions. However, as Boston mentioned, if we classify food as exempt from emissions regulation, where do we draw the line? Food production? Food transport? Retailing and consumption? Fossil fuels are inherent to all stages of food production, even here in ‘clean green’ New Zealand. Kevin Cudby added that, as an exporting nation, our emissions are often on others’ behalves: with food exports, who should pay the emissions price? The producer or consumer? These are all questions that will need to be addressed when creating new domestic climate change mitigation policy. Cudby is not convinced that any specific carbon pricing scheme will work and instead advocates that we should simply “turn the tap off” and ban fossil fuels outright in New Zealand. This resetting of the energy paradigm could be achieved over a transition period of several decades as outlined in detail in his recent book, From Smoke to Mirrors. Barrett noted that similar sentiments are expressed in Dr James Hansen’s recent book, Storms of My Grandchildren. The panel touched on some intriguing issues, but obviously the discussion could have continued for much longer if time had allowed. Fortunately the Climate Change Research Institute will be exploring these issues and more in the Climate Futures: Pathways for Society forum at Te Papa over 31st March — 1st April 2011. The conference will include sessions on climate change psychology and communication. Many thanks to all the guest lecturers for their contribution to the ESCI 201 course. Also, no course is possible without the enthusiasm and hard work of its students, so cheers guys. Well done on your posters and good luck for your essays! I think that people want to be told to truth, regardless of how bad it is, and they will resent any sugarcoating once things really get bad. Those that are in denial will not change their minds based on a “good news” approach. Rather, the spin machine will say, “See, its not so bad.” Like alcoholics, they wont give up their beliefs until the bottom has dropped out. (I base this on personal experience with addiction). However, at that point it will be too late for the rest of us.